Focusing on all the aspects involved in keeping your car in proper working order can be dizzying. First, there’s the oil changes and tune-ups — but you also must remember to have your transmission checked, your engine maintained and so much more. If you have a car that’s approaching 60,000 miles, it’s time to consider one of those often-overlooked components: the timing belt. TransMedics, a top auto shop located in Raleigh off Old Wake Forest Road, is able to handle all of your car’s timing belt needs, including replacement and inspections. Our trusted mechanics have years of experience working with timing belts in vehicles of all ages, sizes, makes and models — what can we do for your car? Without the timing belt (also known as a serpentine belt) your vehicle wouldn’t get very far. In fact, the timing belt is critical to your car’s performance. Some cars have single cam engines, others have double-overhead cam engines. The camshafts operate the valve system in your vehicle’s engine — they open and close valves to release exhaust and bring in air. Your timing belt controls the camshaft, ensuring that each component of your engine works together in unison to operate the car. When the belt fails, it can spell disaster for your engine and other parts of the car. You should begin thinking about replacing your timing belt around the 60,000 mile mark; however, this is dependant upon your manufacturer’s recommendations and the driving conditions you subject your vehicle to. Our mechanics recommend that, no matter your car’s make or model, you should have your timing belt replaced every 80,000 miles at the latest, just to be on the safe side. Timing belts that fail cause headaches for drivers across the United States and beyond. A bad belt, whose teeth has lost its grip, can destroy your engine if allowed to go unchecked. Trust us — we see the “victims” come to our auto shop on a routine basis. You don’t want to be one of them! Do you need a new timing belt? 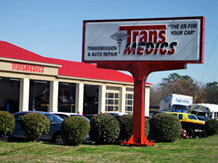 Visit TransMedics today! Our customers drive from all over the Triangle and beyond to take their car to us. We routinely serve customers from Raleigh, Wake Forest, Rolesville, Knightdale, Durham, Cary and beyond!